This is an exciting time in the field of diabetes. The NHS Five Year Forward View, published 3 weeks ago, puts emphasis on disease prevention and refers to a national Type 2 diabetes prevention programme. It draws attention to the role of employers in promoting employee health, in particular around weight management, which will itself contribute to Type 2 diabetes prevention. And it puts forward additional models of care delivery that could go some way to improve the integration of care across the traditional provider institutional boundaries that is so important if we are to successfully improve the experience, care and clinical outcomes for those who already have diabetes. I was also delighted to hear during the announcement of the NHS Five Year Forward View that NHS England’s CEO Simon Stevens plans to nurture and support innovation in the NHS. I have been asked before now whether diabetes in the UK has an innovation culture, and whether innovation is important in tackling diabetes. Today, on World Diabetes Day, I thought it was a good time to pause and reflect on the significant benefits that innovation has brought to this field over the last ten or twenty years, and how it might enable us to rise to the challenges of the future. Diabetes is a huge problem. There are 350 million people with the condition worldwide, including over three million in the UK. Around £10billion is spent every year on diabetes care, around 10 per cent of total NHS spend. Around 90 per cent of those with diabetes in the UK have Type 2 diabetes, and 10 per cent Type 1. Type 2 diabetes is preventable through healthy lifestyle, Type 1 diabetes is not. Type 2 diabetes is rising significantly every year and is tracking the population rise in obesity. While we see emphasis on the primary prevention of Type 2 diabetes, we also have to focus on the prevention of diabetic complications in those that are already living with Type 1 and Type 2 diabetes. Innovation can contribute at many different levels: at individual level through person empowerment and self-care; at the level of the consultation through a partnership approach to care planning; at the team level through multi-disciplinary approaches; at the health systems level through integrated care; at the level of communication through information technology and social media; and of course through research and development of technologies including new drugs. Those responsible for innovation have included people with diabetes themselves, healthcare professionals at the clinical coalface, healthcare leaders and organisations, academics and universities, 3rd sector organisations, and industry. Innovation at the health systems level can have great reach. One of the most exciting innovations I have had the fortune to steer has been the multi-disciplinary foot service we run at Imperial College Healthcare NHS Trust, which in 2007 integrated with community based foot care, so that not only did the hospital-based multi-disciplinary diabetic foot clinic contain the full spectrum of clinical skills needed, but also people with diabetic foot disease could be seen rapidly by the right clinician, in the right place, at the right time. By 2010, our published major amputation incidence was among the lowest ever reported internationally. The huge potential market created through a disease that touches up to 350 million people has led to pharmaceutical industry investment in research and development that has seen the arrival of at least four new classes of drug for blood glucose lowering over 15 years or so, with many new drugs within each class. In parallel we have seen the development of newer insulins with different absorption profiles and different duration of action, as well as a revolution in the modes of insulin delivery. New technologies such as insulin pumps (available on the NHS), continuous glucose monitoring devices (currently being scoped by NICE for availability on the NHS), and closed loop systems/artificial pancreas systems (currently experimental) have the potential to transform peoples’ lives for the better. For Type 1 diabetes, there are also opportunities for cure with whole-pancreas transplantation. As the risks of immunosuppression following transplantation may be greater than the risks of having Type 1 diabetes, we currently tend to only consider whole pancreas transplantation in those that need, or have already had, a kidney transplant for kidney failure. There is also exciting potential with islet cell transplantation, as well as stem cell research. In terms of Type 2 diabetes prevention, there are several dimensions. Whole population approaches include the concerted efforts to tackle obesity through public health, the education system with regard food literacy and physical activity in schools, local authority planning with regard open spaces for exercise, transport decisions such as cycle-friendly routes, and of course interaction of government with the food industry. There also needs to be an additional focus on high-risk communities, such as South Asian communities (six times the risk of developing Type 2 diabetes) and African and Caribbean communities (five times the risk of developing Type 2 diabetes). Finally, we need to effectively identify those at particularly high personal risk of developing Type 2 diabetes, so that they can be directed to the intensive lifestyle management programmes that have been shown in well-conducted randomised controlled trials to prevent the development of Type 2 diabetes in such individuals. We also need to be mindful that there are some particularly difficult times during one’s life-course with diabetes, where innovation can help. The transition from childhood and parental supervision to adulthood and independence can be particularly difficult for many with young onset diabetes (usually/almost always Type 1 diabetes). This is a time when the traditional paternalistic model of healthcare delivery doesn’t suit all. We are therefore exploring the role of social media in the interactions between these young people and their healthcare professionals. At the other end of one’s life-course with diabetes, in old age, there can be an associated higher risk of dementia, where independence and self-management, the cornerstone of successful diabetes management, can be compromised. Innovative support services in this scenario can render a potentially dangerous situation, relatively safe. So we are not short of innovation in the field of diabetes. With six per cent of the population already affected, many more at risk, and 10 per cent of the NHS budget consumed through diabetes care delivery each year, further innovation and its effective roll-out will be a necessary contributor to both our nation’s health and the sustainability of the NHS moving forward. 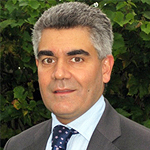 Professor Jonathan Valabhji is National Clinical Director for Obesity and Diabetes at NHS England. He is a Consultant Diabetologist at St Mary’s Hospital, Imperial College Healthcare NHS Trust in West London and so remains highly active at the clinical coalface. The published clinical outcomes from his Multidisciplinary Diabetic Foot Service at the Trust are comparable to the best centres internationally. He is Adjunct Professor at Imperial College London, with a current research focus on diabetic foot disease as well as on diabetes population level health, and past publications on cardiovascular disease in diabetes. He is a committee member of the Association of British Clinical Diabetologists. As National Clinical Director, he is currently providing clinical leadership around a number of national initiatives, including the NHS Diabetes Prevention Programme, a collaboration between NHS England, Public Health England and Diabetes UK that aims to cause England to be the first country to implement at scale a national evidence-based Type 2 diabetes prevention programme.